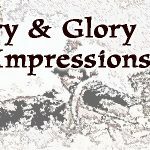 Before moving on to the mechanics of the game, I’ll get out of the way a few little quibbles I have with the game design. This is a single player game, but you can only play the French. I appreciate that this is probably the best challenge for the single player, and is probably the best scenario for a focused re-run of history. But it would be nice to explore the options available to the other major countries all of which had their own particular political interests and rivalry. In a similar vein, obviously there is no multiplayer option either, which I think is something that could have been a lot of fun. The game does offer tutorials. I’m good with having tutorials, but the game requires you to be online if you are to access them as they are basically instructional videos on YouTube. I noticed that only six tutorial links are offered, while there are actually seven on YouTube – so, there’s a bonus! As someone who will often play a single player game offline, the requirement to be online just for tutorials is a little irksome. But tutorials tend to be a one off thing and I can live with that. The tutorials are very well explained, although the presenter has such a “soothing” voice that I gradually found myself nodding off! Aside from the tutorial access, you don’t have to have a permanent on-line connection to play the game. Anyway, the game setup is what it is, so what’s it actually like to play? All the campaigns you’d expect. It gives a player a good variety of starting situations. To give the game its first run through, I started with the default 1805: Dash for the Danube campaign, although the 1800, and 1812 campaigns in particular caught my eye. 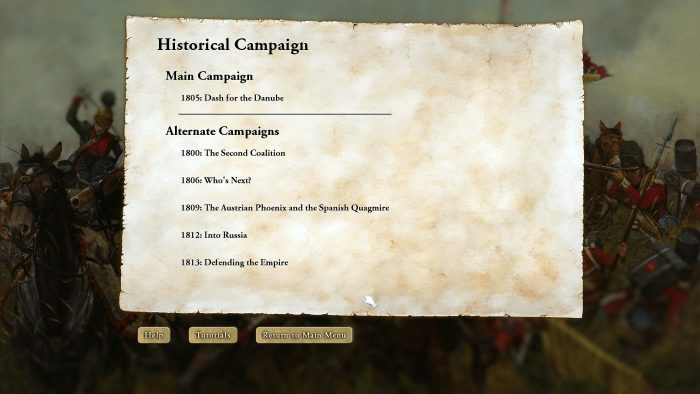 I was pleased to see that the developers had all the main campaigns I’d expect, and additionally an 1800 Second Coalition campaign that you don’t often see, as many Napoleonic games tend to start from 1805. Did I say the art work was nice? And all I have to do here is bring the Coalition nations to the peace table… players get three difficulty levels when you start the game, two giving moderate advantages to the computer or the player. The map is functional, but attractive with pictures of ships, cavalry, sea monsters etc., all in bas relief. It gives a nice period feel. The soundtrack is a mixed bag. It has some nice period music which adds to the immersion, but also has other music which in my view didn’t add anything to the period flavour of the game. 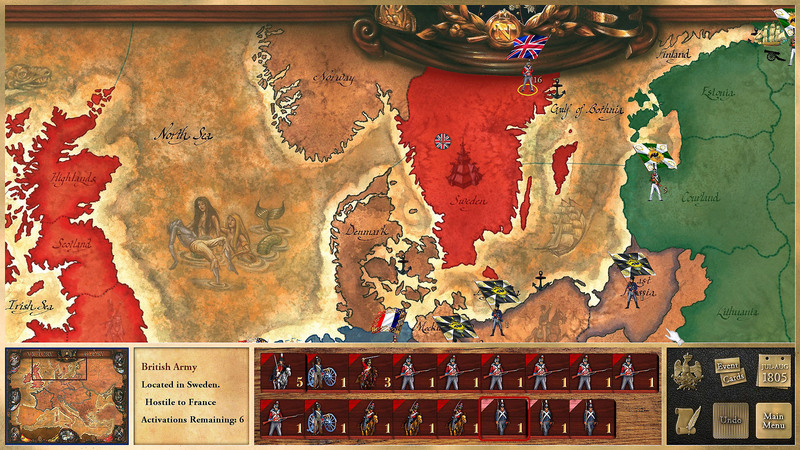 The game plays out in bi monthly turns, and although neither the game, nor the documentation states it, the units within an army approximate to one division. 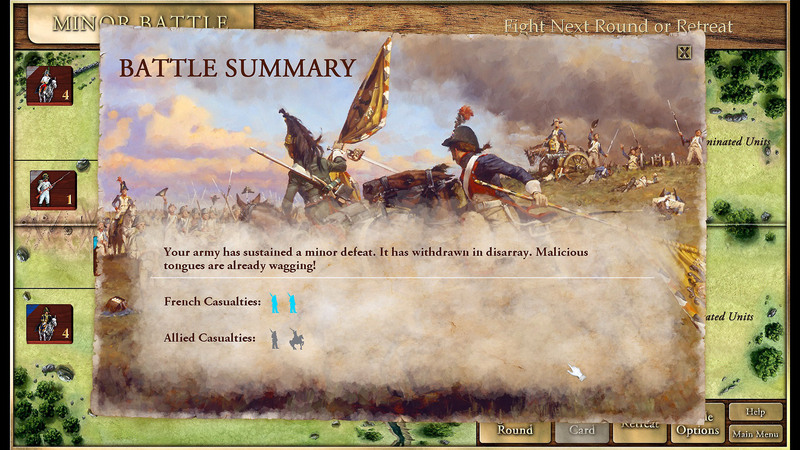 Normal armies can have up to 20 units, and there is a special Berthier chief of staff rule that enables armies led by Napoleon to have 25 units. 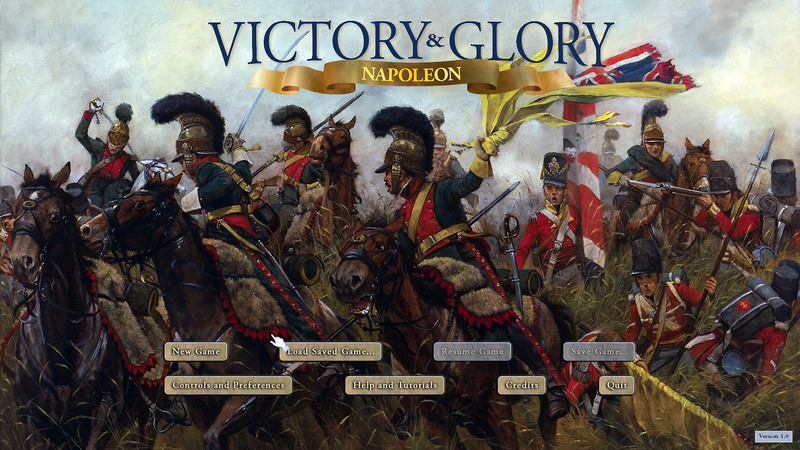 A 5 unit army is representative of a typical Napoleonic Corps. Discretion is definitely the better part of valour when it comes facing a large force of the Royal Navy. A typical turn is pretty straightforward. It involves selecting a number of armies, or fleets up to the turn’s activation limit – which varies between 3-6 activations per turn. You can then move the activated force to one adjacent region (if it has a leader), amphibiously up to several sea zones if you have ships and a port in the start region, or merge it with another army in the region. Normally you can just move one region by land, although there is an event card that can be played to move two regions under certain circumstances. If you move to an empty region that’s it for the army for that turn. However, if you move to an enemy occupied region, or sea zone you can end up doing battle, if you are unable to retreat. I didn’t escape and I am paying for it. 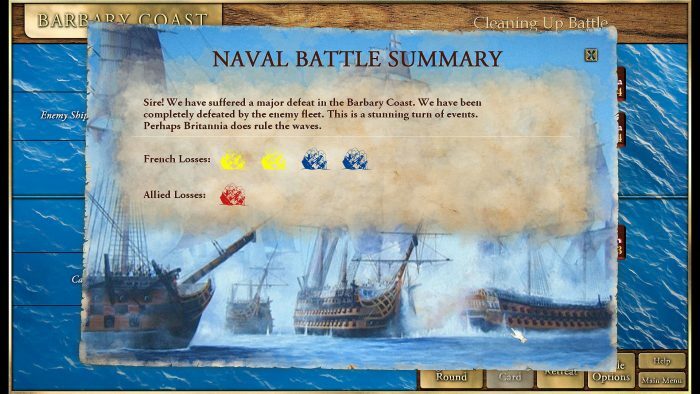 Battles are generally very simple, and naval battles follow similar mechanics to the land battles, although there is quite a lot of calculation going on under the bonnet that belies the simplicity of play. For example, there are special rules to take account of combat experience, horse artillery, and skirmishers built into the combat system. Perhaps I can do better on land? Depending on whether the numbers of units on each side are under eight per side, battles are defined as either major or minor. There is a lot of similarity between the battle mechanics between minor and major battles, although major battles are affected by additional rules making them more interesting and somewhat more complex to minor battles. Battles are composed of several rounds of combat with a minimum of two, thereafter it is possible to break off the action although the winner may pursue and do further damage. Minor battles allow a player certain number of units in your front line dependent on the stack leader’s command rating, with the rest in reserve for subsequent battle rounds. Major battles differ in that instead of one line you deploy into a centre and two wings, and if any of these are cleared of enemy troops you win the battle and can pursue with any available cavalry. There are a number of additional rules affecting major battles like combined arms effects, further rules for squares, manoeuvring uncommitted units between front line sectors and so on. There is a lot more going on with the battle game than simply aim and shoot, and it is done in such an elegant way it seems simple, and exploiting this can require a bit of thought. The British want Sweden? Fine let them have it and stay there. I have other fish to fry. 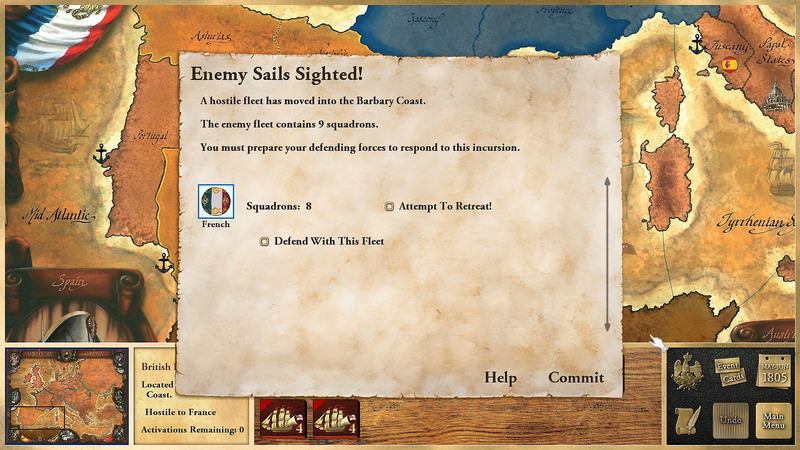 A typical combat round follows this description: The game makes an initiative roll, resulting in either you, or the AI attacking first. When you have the initiative you pick a unit and attack any other unit in the opponent’s line, which can result in damage and progressive disruption to the enemy unit. This continues until all units have made their attacks, or have passed. 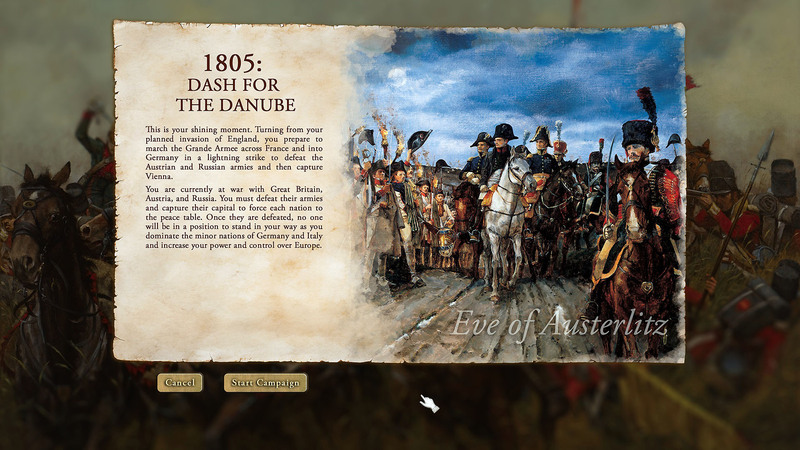 Combat is influenced by quite a variety of factors pertaining to the conditions of the battle. For example, infantry attacked by cavalry may form square. If they don’t the cavalry have a major advantage, more so if the infantry are disrupted. If the infantry are successful in forming square, they have an advantage against the cavalry, but are then very vulnerable to artillery and infantry attacks. In that respect, it is very “rock, paper, scissors”, and mirrors reality. 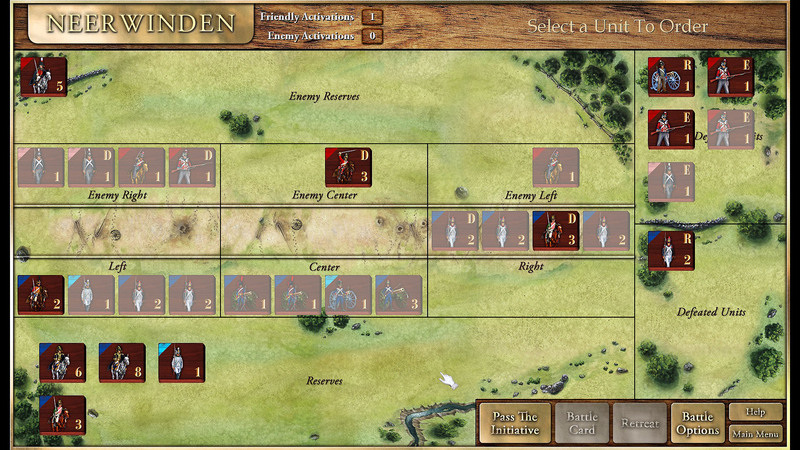 Picking your attacks carefully, and even passing on some attacks is important to playing the game – like not attacking already formed squares with cavalry. It is simple but subtle. The British ‘buy’ loyalty, but we rely on l’ honneur de la gloire! 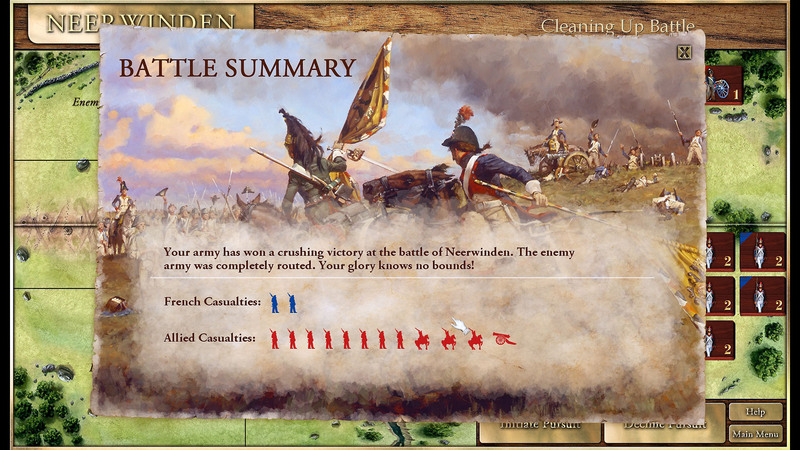 Battles win diplomatic points… sadly not much ‘honneur’ nor ‘gloire’ for my performance to date in my game. 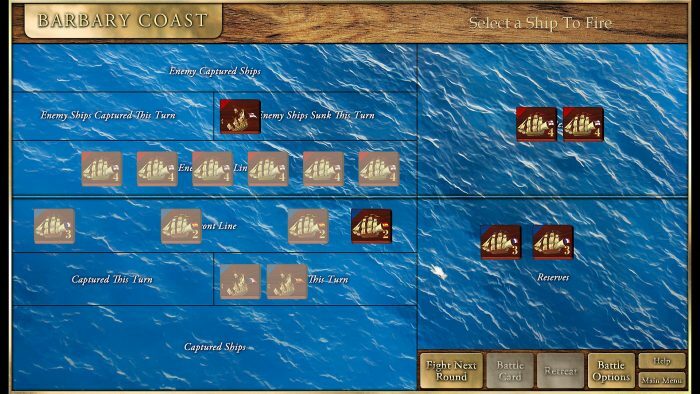 Naval actions play out similarly to land actions but the initiative is modified by nationality and in addition to damaging and sinking ships, you can capture defeated warships and add them to your fleet. Be warned – this really favours the British to the detriment of the French or Spanish. The bottom line with naval battles is to try and avoid the British like the plague, unless numbers are very much on your side. For the most part… they won’t be. Glory is fleeting as Masséna catches the British at Neerwinden. A lot of victory and diplomatic points ride on the result of a major battle. 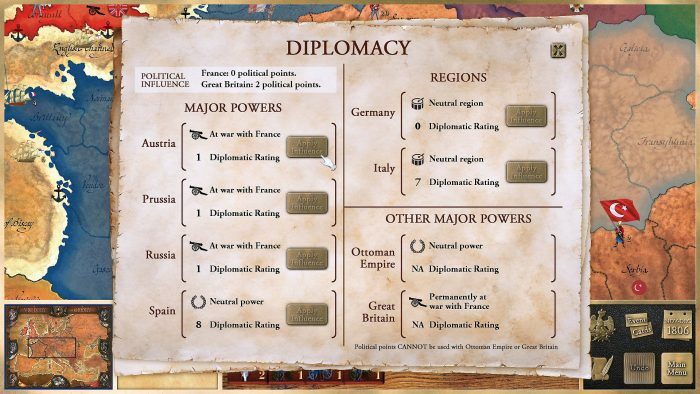 During the turn you can click on the diplomacy icon to check the diplomatic status of France viz the other powers, and if you have diplomatic points can carry out diplomatic actions to pressure other major states. 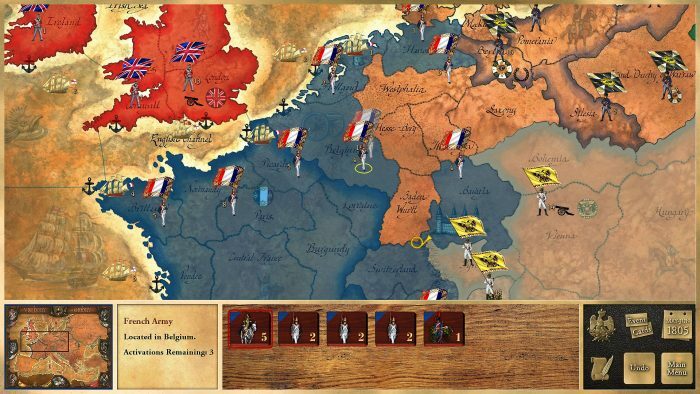 From the French perspective, the player will want to change the status of enemy major nations to neutral to take them out of the war, or ideally neutral friendlies, as this means you can traverse an enemy’s territory. Event cards are a nice piece of chrome in the game. The player will start off the game with a few and will get more, choosing one of two cards every couple of turns selected randomly from a predefined pack. 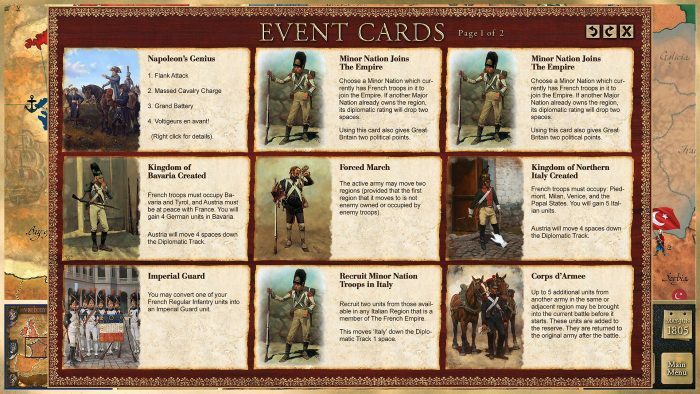 These cards allow all sorts of things like upgrading a unit to a better type like light to heavy cavalry, creating a minor state, storms on the British fleet, other historical events like the Louisiana Purchase, or some tactical advantage to be played in battle, to name but a few. 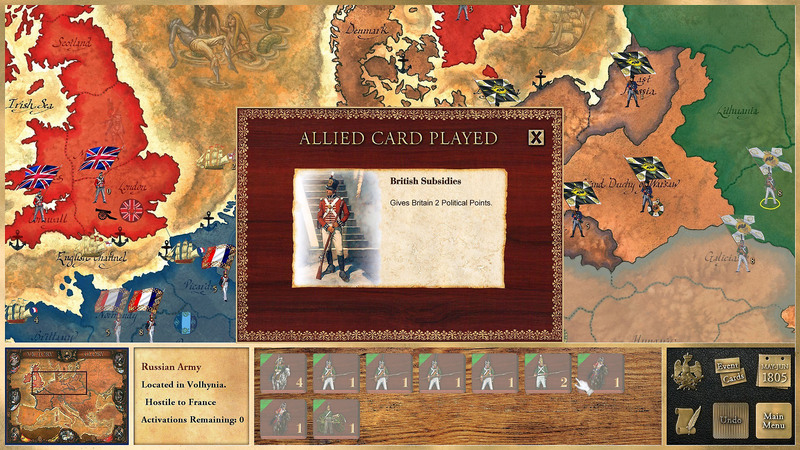 Cards generally can be played at any time during a players turns, although sometimes they will be constrained by prerequisite conditions to provide context. Event cards provide a nice range of options, some of which bring immediate benefits, but some have a diplomatic trade off by raising diplomatic tension. This translates into diplomatic points the other side can spend on various diplomatic actions. So what do I think of the game? I really liked it. I got totally stomped on my first play through, but it is a game that rewards a little patience and planning as I subsequently found. It is very simple to play, but with a lot going on under the bonnet it is quite subtle. I liked the event system which adds an interesting twist, and the well thought out combat system, which elegantly handles a lot of tactical factors without getting bogged down in the detail, which is good for a strategic level game. I can understand why the designers made it single player as the French, since it is a strong challenge for a player, although I can see it could also be a lot of fun multiplayer, or single player as another faction to reflect some of the other rivalries and expansionist ambitions of the other major states.